There are lots of surface finishing methods used after stainless steel castings, including Pickling & Passivation, Vibratory Polishing, Electropolishing, Mirror Polishing. Today we would like to introduce electropolishing process. Electropolishing, also known as electrochemical polishing, anodic polishing or electrolytic polishing, is an electrochemical process that removes material from a metallic workpiece. 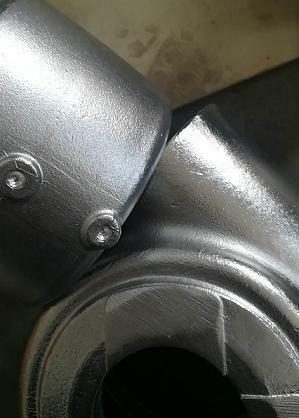 It has become a common treatment for stainless steel castings in industries in which corrosion-resistace and cleanability requirement are particularly high. Preparation of Stainless steel castings: To remove surface oils, greases, oxides and other contaminants that interfere with the uniformity of electropolishing. Eletropolishing: To smooth, brighten and dedurr the stainless steel castings. Post-treatment: To remove residual electrolyte and by-products of the eletroprolishing reaction and dry the stainless steel castings to prevent staining. One of the benefits of electropolishing for stainless steel castings is that it removes iron from the surface and enhances the chromium/nickel content for the most superior form of passivation for stainless steel castings. Electropolishing also provides a clean and smooth surface that is easier to sterilise, while improving the surface finish by levelling micro-peaks and valleys. This methodology is able to polish areas that are inaccessible by other polishing methods. Another benefit of electropolishing is that it removes a small amount of material (typically 20-40 micrometre in depth in the case of stainless steel) from the surface of the stainless steel casting parts, while also removing small burrs or high spots. It can be used to reduce the size of some parts when necessary. Electropolishing has many applications in the stainless steel casting because of its simplicity and its ability to be used on irregularly-shaped products. Any stainless steel casting project with electropolishing requirement, pls contact our stainless steel casting foundry or email cathy.sales02@gmail.com directly.